You never know when you’re going to need a screwdriver, a wrench, a ruler, a cutting blade … and that’s why Swiss Army Knives have been popular for so many years. I found though that for my purposes, the army knife was cumbersome to carry around all day. The I discovered the multi-tool card, which you see below. 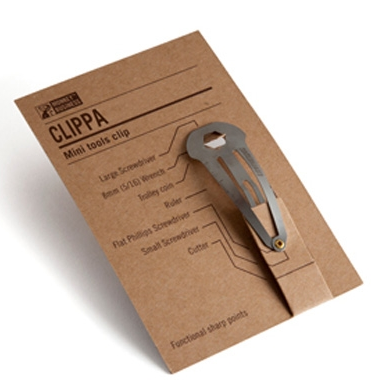 But now, if I need a Phillips screwdriver or if I need to cut a piece of fruit, I need to reach for my handy Clippa – it’s a hair clip that’s a multi tool too. It’s inexpensive, neat and it works – for all its functions. Recently I was in a café with a friend and he was fiddling with his glasses.’All I need to fix this is a small screwdriver’ he muttered. You can imagine the look on his face when I reached into my hair and offered him the Clippa. This multi tool has a larger screwdriver too and I often use the cutting blade. You’re never going to saw through a piece of wood with it but for removing that loose thread from your hem, peeling and orange or taking a cutting from a plant. See more details and photographs here. How very convenient it is too -I don’t have to rummage in my purse and it’s keeping my hair in place. For extra organisation, I keep the item you see on the right in my purse. This is made by the company that created the Swiss Army Knife but is far more convenient and more or less the same size as credit card. This has an LED light and a total of thirteen tools including tweezers and scissors. It lives permanently in my wallet. The knife is more for people who venture into the great outdoors but the Swisscard is excellent for the more urban emergencies t home or at work. I can’t tell you how many times the combination of the Clippa and the Swisscard has come in handy. And what’s more, people are always amazed. I want this hair clip! I love this Clippa! If I order it from the link will you get credit? Thank you for the information! I like the Swisscard, too! These are great emergency preparedness items that will go well in my kit. Being prepared for any emergency is always good, Sherry!